Last edited by Tungsten on Sun Dec 30, 2018 6:35 pm, edited 1 time in total. Description: The Aruna, modeled after an Amegakurian wetland avian; the Needle Bird. The small puppet is designed to function as a lethal ambush weapon. Fully extended, each Aruna is approximately the size of a Hummingbird, bearing white, black and blue coloration, allowing it to blend with the native environment. Closer inspection will naturally reveal mechanical components. Each Aruna's primary weapon is the Blasting Clay payload located in its central cavity, with a palmar and dorsal ventral opening for whistle-based Sound techniques (That curiously mimics the keening sound of a Needle Bird) as its secondary weapon. Atsushi, keen on making the Needle bird as light and cost-effective as possible, designed a simple gliding mechanism with four folding wings; enabling these avians to be simply drawn and flicked or thrown. Fully retracted, an Aruna can fit in the palm of the puppetmaster's hand, and is light enough to be stored in a pocket or sleeve; guided on a single chakra thread. They have a natural range of 75m by string, with an additional gliding range of +15-20m unaided, and a detonating range of 350m. Can be "Reloaded" in friendly villages and groups like standard weapons. Body cavity can contain more than just clay. Total Price: 36,000 for 5 Aruna, 2,200 Ryo individually. *NOTE: Given the size of these puppets and lightweight nature, minimal material is required, especially for the wings. 1 Unit of Cloth should suffice for 5. Blasting Clay can be produced manually and considered part of Atsushi's inventory. Regarding the stats, the Blasting Clay does all of the work here, so Dexterity and Agility are all that matter. Last edited by Tungsten on Mon Jan 07, 2019 6:32 pm, edited 4 times in total. You should pay up for the melody arm as a component though. You can conduct sound techniques with more than the Melody Arm. Bells and flutes work just fine. So would a whistle. My bad, I should have worded that better. Emphasis on sound component. Bell, whistle, flute - still gonna pay more if you wanna conduct sound techs. Added 1 unit of Steel for 25,000 Ryo for the sound components. I figure that should be enough for 5 of them. Description: Legend has it that the Dragon Snail dwelt for three thousand years, in the mountains, land, and finally the sea before becoming an undersea dragon, ruling the deep. Amegakuran culture is stepped in such mythologies, and like his master Yuzuru the Crane, Atsushi drew upon them to create his piece, the Shussebora. As a design from earlier in his career, the Shusseboro features classic weaponization of the whole piece and an emphasis on quality versus quantity; marking it as distinctly more detailed than later when he began designing disposable puppets. In all, the Shussebora is artistically a beautiful piece, with bronze, iron, and dark wood running throughout the piece, with hints of red and rust-brown decorating the "Dragon", while shades of grey and black metals adorn the "Snail Shell" of the weapon. Shusseboro takes cues from serpents, with a long body of overlapping segments, with heavy armor layering across its back. A sinistral shape when the puppet withdraws into itself, enabling it to defend and condense its size. Starting with the head, it is vaguely draconic in shape, with a mouthful of razor-sharp teeth, and two barrels extending to mimic eyestalks, connecting to internal piping, with a sharp point protruding from the snout. The muzzle is reinforced with iron, allowing it to deal blunt damage and unleash dangerous techniques. The head can be launched at high speed, attached via chain, at targets. Throughout the body pipes, wiring, wood, iron and chain support the structure, reinforce it, and feed projectiles through the puppet. This is connected to a series of scrolls and magazines that dispense projectiles as needed. Fully extended, the Shussebora resembles a mix between dragon and sea-slug, with its protrusions and sinuous, flat and flexible body. Its entire dorsal side is armored, and thus when it coils into itself, it transforms into a weaponized, iron-clad conch shell. This Shell form can be utilized for devastating hammer blows against the enemy and shielding the wielder against attacks. Poison Gas Siphon x2 || Two pipes extend from the backside of Shussebora to release poison gasses and liquids from internal systems. Makabishi Trap || Hidden within the Shussebora are Makabishi spikes that can be deployed for a hidden field hazard, or combined with Ninjutsu. Snail Flail || Fully withdrawn, the Shussebora resembles a Triton Conch, a mollusk with a conical shell. The Shussebora's heavily armor exterior becomes a double-ended, pointed weapon, especially when strengthened with nature affinities. Can channel the wielder's nature affinities for heavy impacts. The Dragon Snail's name and secret technique are nods to the Glaucous Atlanticus, a vibrant blue sea slug said to resemble a dragon. When fully deployed it more readily resembles a sea slug, with its numerous barrels and protrusions. Shussebora's artistic design borrows from the steampunk-mythology aesthetic of Amegakure in the Naruto Canon, where Nagato ruled as a "God", and Konan as an "Angel", while a tower in the city bore religious motifs from Asia. Likewise, it follows IC continuity, where Atsushi built his puppet around Yuzuru's Jorogumo puppet; a shapeshifting demon of Japanese mythos. The Shussebora's "Snail Flail" and ninjutsu-enhancement is a nod to Dungeon & Dragon's "Snail Flail" monster; a beast with flail eyestalks that mitigated magic. As a Conch, it holds connections with the Shankha, a sea-snail strongly associated with Hindu mythos. Note none have been purchased in my updates thread. Last edited by Tungsten on Mon Jan 21, 2019 3:25 am, edited 2 times in total. Puppets do not have a Constitution stat. Edited to include the new stats. Eva cleared up materials as well, so I added steel to the materials to soak up 50,000 and add to its defenses. 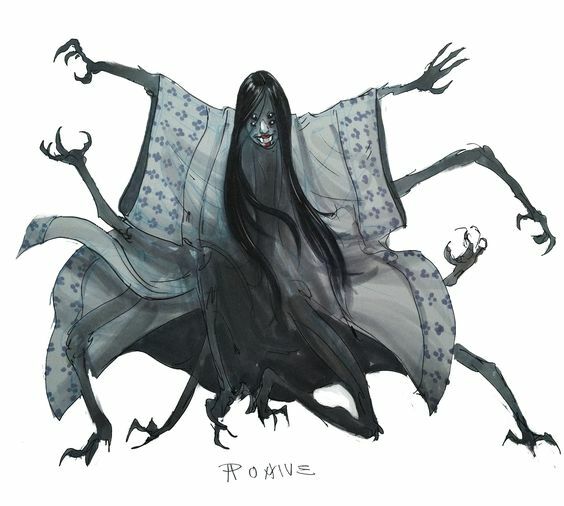 Description: Jorogumo is a fearsome humanoid puppet, initially of Yuzure's craft. Draped in a dark cobalt and silver kimono of multiple layers, the creation bears the torso and upper body of a female human, while multiple appendages bearing weapons are equipped along its spine. Jorogumo's head is nearly featureless, with eight blue glass spheres for eyes aligned in two vertical rows. According to Atsushi, under Yuzure's control the Jorogumo appeared to be more of a ruthless spirit than machine. Jorogumo is armed with eight appendages as its primary weapons; two arms, each capable of bisecting themselves at the shoulder, and four insectoid limbs give it the appearance of a monstrous spider. Within its primary arms are a pair of telescoping spears, extended through the divided palms. At the elbow, a pair of projectile launchers can be found. Yuzure, taking cues from older Sunagakure works, placed a replicating seal within the shoulder blade, enabling Jorogumo to utilize "Puppet Technique: Thousand Hands Military Art" and truly become a writhing horror. Fixed to Jorogumo's spine and back are four arms, attached with dense chains, and gripping an hourglass-shaped mace. The lovecraftian nightmare doesn't end there. At first sight, Jorogumo is a beautiful maiden, deceptively dressed and crafted well enough that for some she is love at first sight, and death the second. The puppet's head contains a powerful set of crushing mandibles, while her skull contains a P-64 Type II flachette launcher; feeding and firing heavy shells from her mouth with explosive force. Mimicking another demon of lore, the Rokurokubi, the puppet's head and neck is capable of extending on a spool of chain and telescoping armor-- allowing the puppetmaster to attack from a distance, and keep on attacking even when the rest of the unit is compromised. Even Jorogumo's hair, dark and silky functions as a dangerous weapon; dozens, if not hundreds, of hair-like threads are capable of channeling the "Howling Hair Sound Wave" attacks. Lastly, within Jorogumo's torso, cocooned by a steel rib-cage, is a sphere of Explosive Clay, mixed with volatile poison. The dangerous substance can be charged and detonated; destroying the puppet entirely and releasing a dangerous toxin across the battlefield, or released as a single payload for devastating effect. Blasting Clay || Each puppet carries blasting clay in its center, triggered with a handseal, it will detonate and deal lethal damage to opponents with dangerous shrapnel as a bonus.